I always figure if I ever go to prison I can still make theater with dancing my hand against the cell wall. But that would imply a room with a view so that light could shine in--- I guess I better not get busted till I tire of the magic of shadow puppetry. 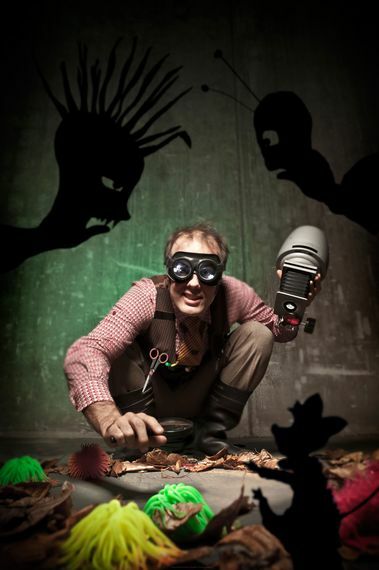 Jeff Achtem is the creator and star of "Swamp Juice", an interactive, immersive shadow puppet show that is having its North American premiere at the Barrow Street Theatre. His swamp is inhabited by a biological community of crossovers from Dr. Seuss and South Park, all over lorded by his imperial weirdness, Mr. Achtem. A virtual whirligig of motion, crazed sound effects and otherworldly dialogue, Achtem stirs up his delicious brew right before our eyes, in front of a bare light bulb Theoriginal score is composed by David Henry, Nick Carver and Tristan Kelley. His puppets are created from bits of rubbish and standard household items. Very green. Nothing wasted. The audience is encouraged to get involved and once the first kid yells out 'Wedding! ', anything goes for the 'adults. At the show's remarkable finale, retro 3-D glasses allow audience members to virtually leap into the world. Survival of the fittest was never this much fun before and Mr. Acthem, who also sells kits to take home, really understands the point of 3-D. You want to duck your head before the flying whatchamacallit takes off your toupee or else it just ain't 3d. This adorable show gives new meaning to multi-tasking and left me with the thrill of having won 10,000 points on a pinball machine.